The Spaniard loses the opportunity to cut with respect to the 20 'big' Roger Federer and will continue with 17. The Serbian compresses the race to be the best. With his defeat in Australia, Rafa Nadal missed the chance to stay only two Grand Slams from Roger Federer's record, which accumulates 20. 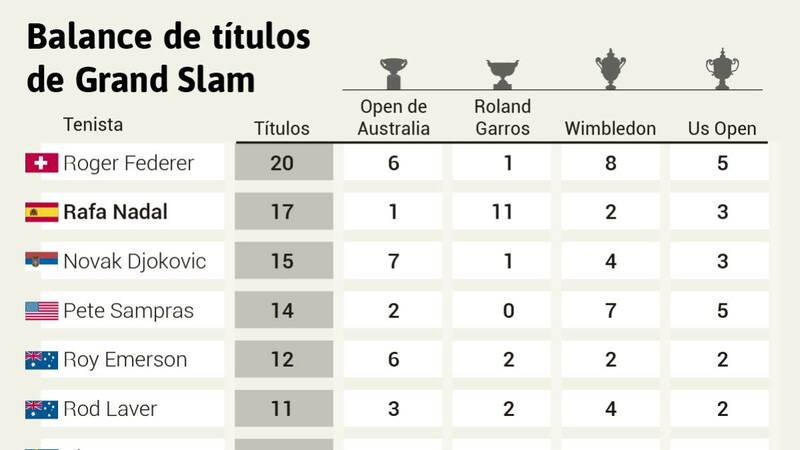 And the one that is aiming for the race for being the biggest in history is Novak Djokovic, who Chadena three majors in a row (Wimbledon, US Open and Melbourne) to be placed with 15, two of Spanish, and tie with Pete Sampras. Federer will be 38 years old in August, and he won his last big one in Melbourne last year. After four years of drought (2013 to 2016), in which he felt his downhill, the Swiss knew how to reinvent himself to add another Wimbledon and two open ocean more. Nadal (32 years) also saw his run of victories at Roland Garros 2014, and between 2015 (anxiety problems) and a 2016 in which he had to retire from Roland Garros for a wrist injury , did not win any big. But in 2017, and after the Swiss attended the inauguration of his Academy in Manacor and half jokingly said they were "for charity games", they managed to reinvent themselves to reach the final in Melbourne and resume the rivalry. From not having seen Handicapped by injuries, Nadal could have more than 17 Grand Slams. Since 2005, when he won his first Roland Garros, he had to give up six and in three he retired due to physical problems. However, Basel won his first major at Wimbledon 2003 and then played 50 in a row. He only resigned from Roland Garros and the US Open in 2016 due to back problems and in Paris 2017 and 2018 when he decided not to play ashore. Djokovic (31 years old) had been absent from the fight in 2017, without any illusion, but he has recovered it with tremendous strength.